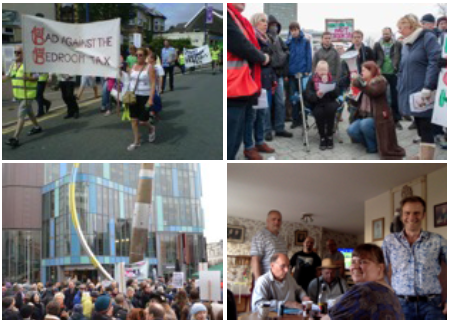 Cardiff & South Wales Against the Bedroom Tax (C&SWABT) is a tenant led, grassroots campaign committed to fighting the ‘bedroom tax’. Our experience indicates that the financial burden of the bedroom tax continues to fall predominantly upon the sick, disabled and most financially vulnerable members of our community. Currently, approximately 33,000 households face the impossible choice of finding extra-money they do not have or ‘downsizing’ to smaller homes that do not exist. 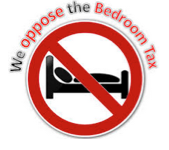 C&SWABT has previously called for the Welsh Government to follow Scotland and Northern Ireland’s lead by providing the additional £17 million necessary to effectively cover the cost of the bedroom tax in Wales. Following publication, a coalition of sector agencies and high-profile individuals, including, the Archbishop of Wales called upon Welsh Government to find the funds to take tenants out of this charge. 4. Partnering with social landlords to take forward pilots and brokering agreements in Cardiff, Merthyr, Bridgend and Caerphilly. 7. Nine local groups established. Skilling and education through campaigning activity. Tenants brought closer to the process of power! Approximately 33,000 households face the impossible choice of finding extra-money they do not have or ‘downsizing’ to smaller homes that do not exist. Over the course of 2013 and 2014, social tenants in wales were made subject to 5136 suspended possession orders. Dramatic cuts in discretionary housing payment, combined with the perfect storm of further welfare reform can only see more people facing insurmountable debt and eviction threats. Currently, discretionary housing payments constitute the single means whereby many tenants who cannot objectively downsize cover the cost of remaining in their homes. Perversely, the Local Authority Duty of Care introduced by the Housing Act will mean that a decreasing pot will need to be spread across a wider catchment. Meanwhile, following the outcome of the May General election, there are strong indications that some social landlords are adopting a more aggressive approach to arrears. This is swiftly giving rise to a postcode lottery in which some seek to transfer the risk to tenants whilst others despair of settling a unified approach. A tree is best measured when it’s down – a warning! Following on from work with the WLGA, our campaign is stunned by the lack of disaggregated data covering; 1: the number and profile of bedroom tax affected tenants in receipt of DHP and, 2: the number of bedroom tax tenants subject either to suspended possession orders or pre-action protocol. Traditionally, arrears have been cited as the best means of measuring risk. However, and in combination with hidden debt, there is convincing evidence to indicate that ‘tenant resilience’ has been degraded beyond endurance. Welsh Tenants have carried out important work around the growth of local food bank usage. Similarly, Oxfam Cymru, in partnership with the Trussel Trust, sought to map the immediate factors driving the rise of extreme poverty. C&SWABT suggests the existence of a developing crisis not unlike that experienced in 2007. In essence, whilst Welsh Government, agencies and the sector are measuring the wrong thing, true indicators (to the best of our knowledge) have neither been captured nor collated. Consequently, when the tree falls, it will do so both abruptly and in such a manner as to inflict maximum pressure on overstretched support services. The backlog at law will be measured in months, if not years. Social landlords will be forced to transform their business models doing irrevocable vandalism to the sectors ethos. Homelessness will spike beyond the capacity of the private rented sectors local ability to accommodate. Estates will fight back. 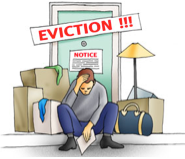 The majority of evictions will be bitterly contested and communities, faith groups and other constituencies will be brought into direct conflict with bailiffs and local decision makers. In short, we will see a pattern currently emerging in London replicated throughout Wales. We are fully aware of the budgetary challenges posed by central government underfunding. However, in our view the cost of not intervening will be measured both in terms of thousands of evictions and the irreversible toxification of the Welsh social housing sector. Welsh Government spends a lower percentage of its expenditure on housing than either Scotland or Northern Ireland. It is essential that the housing budget is expanded so that the DHP top-up does not come at the expense of other vital housing services. In Scotland, no tenant pay’s the Bedroom Tax. We call upon Welsh Government to show the same leadership, act upon the Committees recommendation and take tens of thousands of Welsh tenants out of poverty and misery. In total it is costing Scotland £50.2m annually to offset the tax, including £15.2m from the DWP and the rest (£35m) coming from Scottish Gov. So, the additional contribution from Welsh Government would be in the region of £18/17m. In budgetary terms this is in no way unachievable. 6. Developing engagement with RSL’s, CHC and the WLGA. Robust press campaigns designed to address bad practise and highlight Central Government failures. 7. Collaboration and support around Welsh Tenant and Shelter Cymru initiatives. C&SWABT is eager to engage. We work to empower hundreds of bedroom tax affected tenants across South Wales. For further information, please contact cardiffagainstthebedroomtax@gmail.com or call Jamie on 07717779819, or for Bridgend enquiries, you can call Andy on 078 1066 3241. This entry was posted in Uncategorized on October 18, 2015 by Bridgend's Green Leftie.